2 Certification . . . . . . . . . . . . . . . . . . . . . . . . . . . . . . . . . . .
3 IC 20 function . . . . . . . . . . . . . . . . . . . . . . . . . . . . . . . . . .
3.1 IC 20..T Connection diagram . . . . . . . . . . . . . . . . . . . . .
3.2 IC 20..E connection diagram . . . . . . . . . . . . . . . . . . . . .
4.5.2 2-point operation with flame proving period . . . . . . . . . .
4.5.3 2-step operation with one or two digital inputs . . . . . . . .
4.5.4 2-step operation with two digital inputs . . . . . . . . . . . . . .
4.5.5 3-point step operation . . . . . . . . . . . . . . . . . . . . . . . . . . . .
4.5.6 3-step operation with one or two digital inputs . . . . . . . .
angle for the “open” position . . . . . . . . . . . . . . . . . . . . . . . . . . .
4.5.9 2-point operation with switchover of the running times . 4.5.10 3-point step operation with running time fractions . . . .
4.5.11 3-step operation with two digital inputs . . . . . . . . . . . . . .
4.5.12 3-point step operation with low position . . . . . . . . . . . . .
7.1.1 Cable selection . . . . . . . . . . . . . . . . . . . . . . . . . . . . . . . . . . .
7.1.2 IC 20 . . . . . . . . . . . . . . . . . . . . . . . . . . . . . . . . . . . . . . . . . . .
7.1.3 IC 20..E . . . . . . . . . . . . . . . . . . . . . . . . . . . . . . . . . . . . . . . . .
7.1.4 IC 40 . . . . . . . . . . . . . . . . . . . . . . . . . . . . . . . . . . . . . . . . . . .
in order to control the gas and air flow rates on gas burners. IBH, IBHS or linear flow control IFC. the infinitely adjustable switching cams upon commissioning. This enables precise settings even in the low-fire rate range. checking function can be used in automation processes. such as hours of operation, actuating cycles and a faul history. data over a specific period of time. The IC 40 offers additional functions. 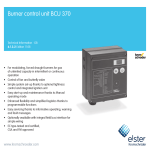 It can be used in continuously-controlled burners and in stage-controlled burners. The actuator can also be controlled “by hand” using the software. copied from there into other actuators, thus saving time during the commissioning process. by a three-point step controller. 0 – 10 V signal. in accordance with the capacity demand. Terminal 26: the controller operates between the open and ignition positions. Terminal 27: the controller operates between the open and closed positions. in On/Off or High/Low intermittent mode. can be adjusted between 5 and 25 seconds. adjusted between 5 and 50 (75) seconds. 3PS and moves the butterfly valve BVA to the ignition position. butterfly valve stops at its current position. butterfly valve BVA to the pre-purge position. of ignition.) The burner starts. output on terminal 26 of the BCU. 11, 2-step operation with two digital inputs). digital inputs and variable adjustment angle). between 5 and 25 seconds. temperature accuracy in the furnace. – Electromagnetic Compatibility Directive (2004/108/EC). Certified by Gosstandart pursuant to GOST R.
integrated feedback potentiometer offers the option of monitoring the current position of the actuator. The switching point is set directly on the cams with a screwdriver. can be checked via two additional, floating, infinitely adjustable switches. correspond to a valve angle of 45°). The minimum and maximum adjustment angles can be set manually using the keys. interference in the input signal. of the actuator via the continuous 4 – 20 mA output signal. See page 70 (Project planning information). See page 76 (Technical data). page 20 (IC 20..E DIP switch). signal is applied to terminal 5, the actuator closes. 0 – 10 V) via terminals 17 and 18.
controlled via terminals 1 and 2. * Value will only be accepted, if the Min. or Max. button is pressed for another three seconds. by means of a DIP switch on the actuator. performed on a PC using the Kromschröder BCSoft® software. All settings for the actuator IC 40 are made using BCSoft®. performed conveniently using the software.  Actuators IC 20, IC 40.
at any time using BCSoft® (if mounted on BVA, BVG or BVH). position of the actuator in the case of intermittent operation. They can be changed in BCSoft®. closing behaviour of the actuator. (Priority and running time in operating modes 1 – 10). can be defined on site. Basically, the following parameter limits must be noted. The “high position” may not be selected less than 10%. seconds, can be set dependent on the operating mode. A minimum running time is required for each change in position. IC 40 to the minimum possible value. If the actuator is to operate as fast as possible, a time of 0 seconds can be pre-set. 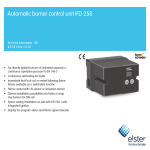 After they have been entered, the valid parameters are automatically read out and displayed in BCSoft®. times for the application, see page 60 (Manual mode). RO 2, see page 59 (Outputs). 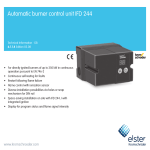 displayed and read out in BCSoft®, see page 61 (Statistics). General description, see page 22 (Operating modes). (“low” position may also be 0° = “closed” position). position is reached, the actuator moves directly to “low” position in the percentage time of t2. P 68018 and P 68019, see page 54 (Parameter sets). position in running time t1. further to “high” position in running time t3. to the “low” position in running time t4. position is reached, the actuator moves directly to “low” position in the percentage time of t4. valve, the waiting time t2 is appropriate for flame proving. see page 54 (Parameter sets). position (“low” position may also be 0° = “closed” position). position to “middle” position in running time t1. If, in addition, digital input DI 1 is activated, the actuator approaches “high” position in running time t2. possible to operate with both inputs in high/middle/low intermittent mode. P 68016, see page.54 (Parameter sets). an interpolation point and can be freely programmed. to “low” position in the percentage times of t3 and t4. priority of the digital inputs. at DI 1 has no effect unless a signal is also applied to DI 2.
digital input DI 2 is active, the actuator closes. means that it can stop at any position. with t2 for the entire “high” to “low” actuating travel. 68013, P 68014, see page 54 (Parameter sets). Open to “high” position at max. in the sector of ceramics, steel and aluminium. up to 51 s (2 x 25.5 s). adapted to that of the gas circuit. Digital input DI 1 functions as a pulse input. mode via digital input DI 1.
intermittent mode via digital input DI 1.
for heating mode in order, for instance, to reduce the prepurge time. capacity (signal at DI 2). The running time is shortened in accordance with the reduced position. or closes at constant speed. fact that both digital inputs function as pulse inputs. mode via digital input DI 1 and operates in middle/low (middle/closed) mode via DI 2. Alternative function: 2-step operation with constant speed. fro between “high” and “middle” position. The running times are switched over via DI 2. Switchover of the running times may also occur during movement of the actuator. actuator can be stopped in any position. via a 3-point step signal. The actuating function is limited by the “low” and “high” positions (“low” position may also be 0° = “closed” position). Running times up to 51 s (2 x 25.5 s) are possible in this operating mode. 68011 and P 68020, see page 54 (Parameter sets). “closed” position and the butterfly valve is closed. valve moves to “high” position for pre-purge. to “middle” position (high-fire rate). the butterfly valve moves to “high” position. 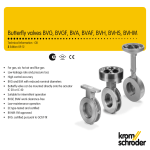 the butterfly valve moves to “middle” position. remains in its current position. actuator moves from the low-fire rate position to “low” position. signal at DI 1 drops, the actuator moves back to “low” position. low (analogue/closed), whereby the analogue signal determines the adjustment angle for the “open” position (= setpoint). varied via the analogue signal is set in BCSoft®. Example: 4 mA for 60% opening and 20 mA for 100% opening. order to obtain longer running times (> 25.5 s). “open” position but defines only the speeds here. crucial as regards the “analogue” position. The “high” position is set to 50%. P 68026, see page 54 (Parameter sets). permitted range are adapted automatically by BCSoft®. may also be 0° = “closed” position). high/low (high/closed) and analogue/low (analogue/closed). The adjustment angle for the “open” position which can be varied via the analogue signal (position setpoint) is set in BCSoft ®. owing to intermittent operation of the burner. P 68027, see page 54 (Parameter sets). be higher than the “high” position in this operating mode. intermittent mode via digital input DI 2.
position. This application can be used, for instance, for purging a furnace or kiln. In idle state (DI 1 with no signal), the actuator is in “low” position. The running times can also be switched over in ongoing operation. order to obtain longer running times (> 25.5 s). “open” position but only defines the speeds. P 68029, see page 54 (Parameter sets). pre-set by this. This angle is approached with signal at DI 1.
chart 1/closed) intermittent mode via digital input DI 1.
chart 2/closed) intermittent mode via digital input DI 1.
may thus also be higher than that of chart 1.
for the “open” position are pre-set by the current signal. actuator remains in “low” position (“closed” position). P 68030, see page 54 (Parameter sets). The speeds are retained in both intermittent modes. running time t1 for the entire “low” to “high” actuating travel. digital inputs and the analogue input in this case. available, see page 57 (Inputs). adjustment or for hot-air compensation. 1/closed) intermittent mode via digital input DI 1.
mode via digital input DI 2.
or hot-air compensation to be implemented. P 68031, see page 54 (Parameter sets). valve moves to “high” position for pre-purge (high-fire rate). the analogue signal is set in BCSoft®. instance, in the event of a motor defect. “closed” position within the closing time tS < 1 s.
cases, besides changing the furnace or kiln atmosphere. must feature this function, see page 69 (Selection). motor data and calibration data. parameters, see page 54 (Parameter sets). Certain special functions can be programmed with this, changing the behaviour of the digital inputs, see page 57 (Switching logic). to the input, this is recognized as “On” signal (positive logic). while no voltage results in an “On” signal (negative logic). 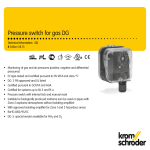 operating modes provides new options for defining the behaviour of the actuator. threshold of the analogue input is defined at approx. 3 mA. The assignment of current value to position can be freely defined via 5 pairs of values (interpolation points). prolongs the response time to a change at the analogue input. the analogue input to detect a change of 0.02 mA (hysteresis). BVAF, BVG, BVGF, BVH or BVHS). Consequently, the hysteresis may be increased to up to 0.2 mA. case as the basic setting. priority in BCSoft®. The digital inputs have priority by default. actuator follows more slowly accordingly through to step-bystep movement, see page 23 (Running times). contacts. They can be integrated in automation processes. signal is not actually a fault signal. for instance, the behaviour of a cam disk can be simulated. page 62 (IC 40 connection diagram). imum value and one maximum value. These settings are page 70 (Project planning information). responds to the presets from the software. input (option), this can also be simulated. ignition (middle position) and the high-fire rate (high) position. of the step motor (< 0.05%). position is always approached at maximum speed in this case. to a position, for example ignition position. values, is displayed in statistics in BCSoft®. for recording information over a specific period. is saved automatically and displayed together with the customer data. Counters and measured values cannot be reset or deleted. Saving error for adjustable parameters, etc. The function of digital outputs RO 1 and RO 2 can be adjusted using BCSoft®. Relay switches when valve between min. * These warnings are displayed as positioning errors in BCSoft®. 2) C 20-07: 2.5 Nm, IC 20-15/-30/-60: 3.0 Nm. 2) IC 40: 2.5 Nm, IC 40S: 3.0 Nm. 3) Various parameter sets can be pre-set ex-works. 4) Supply the IC 40 permanently with voltage. 1) Various parameter sets can be pre-set ex-works. 2) Supply the IC 40 permanently with voltage. 1) Please quote the required parameter set in your order. Running time programmable between 4.5 and 76.5 s.
IC 40: 2.5 Nm, IC 40..S: 3.0 Nm. 4) If “none”, this specification is omitted. 5) Can be retrofitted on IC 20. If “none”, this specification is omitted. Install supply and signal lines separately. Observe EMC Directive for installation of signal lines. be electrically isolated to avoid leakage currents. interference, it may be necessary to increase the output current by using an additional load resistor on the signal sensor. Load resistor = 3.3 kΩ, 0.6 W.
the status or of the position. whether and when a fail-safe signal is required. must be allowed for when selecting the nominal cross-section. signal with the feedback signal of the IC 40.
start fuel flow rate using the air/gas ratio control GIK. the current position of the actuator. life of the feedback potentiometer. IC 20, see page 74 (Accessories). the actuator is available with fitted potentio­meter. Installation position of actuators IC 20, IC 40: vertical or horizontal, not upside down. If the actuator is used with hot air, the pipeline should be adequately insulated so as to reduce the ambient temperature. butterfly valve must not be insulated. position specified by the operating mode and input signals. the screw connectors near the valve. 1000 Ω feedback potentiometer. The power consumption of the potentiometer is max. 0.5 W.
230 V AC, -15/+10%, 50/60 Hz. Angle of rotation: 0 – 90°, adjustable. minimum pause between 2 pulses: 100 ms.
Enclosure: IP 65 pursuant to IEC 529. Safety class: I pursuant to EN 60335. 3 × M20 plastic cable glands. Ambient temperature: -20 to +60°C, no condensation permitted. 4.9 VA at 50 Hz, 5.8 VA at 60 Hz. 8.4 VA at 50 Hz, 9.5 VA at 60 Hz. 4 – 20 mA, electrically isolated, max. 500 Ω load impedance. to terminals 3 and 4. 0 – 10 V: 100 kΩ input resistance. IC 40: 100 – 230 V AC, ±10%, 50/60 Hz; the actuator automatically adjusts to the respective mains voltage. switch-on peak current: max. 8 A for max. 10 ms. Angle of rotation: 0 – 90°. Holding torque = torque as long as permanent supply voltage is applied. IC 40: 24 V DC or 100 – 230 V AC each. Current requirement of digital inputs: 3 mA ± 1.5 mA. 1 analogue input (optional): 4 – 20 mA (internal load impedance: max. 500 Ω at 20 mA). Signalling contacts designed as relay change-over contacts. drive stopped = permanent light. calibration in progress = flashing light. The running time per 90° depends on the required torque. The running time is reduced by a factor of 0.83 at 60 Hz. of the mains frequency. The running time can be freely programmed between the limits of 4.5 – 76.5 s.
We recommend a function check once a year. 5 million changes of direction. ignition device on start-up of the burner. maximum quantity in intermittent mode. can improve our documents further and suit them to your needs. in the interests of progress.